For something people use to feel refreshed, gum is pretty revolting. It's left on the ground, under the table, behind ears, and is generally a blight on our Mother Earth. So, other than dragging it around on the soles of our shoes, what are we going to do with all of it? Turn it into the soles of our shoes apparently. The Gumshoe is, naturally, a shoe made partially from recycled gum. It's a collaboration between the Amsterdam marketing organization Iamsterdam, the designer Explicit Wear, and the sustainability company Gumdrop. Gumdrop makes a compound called Gum-Tec that's about 20% recycled chewing gum, and this compound is used to make the sole of the sneaker. The rest is made of leather, so it's not technically all gum. But that's actually good news because that would be disgusting and no one would wear that. About 2.2 pounds of gum is used for every four pairs -- which comes out to around half a pound per shoe. Roughly 3.3 million pounds of gum is unceremoniously applied to the pavement of Amsterdam each year, which means millions of dollars in clean-up costs for the city. The gum in these shoes comes directly from those streets. 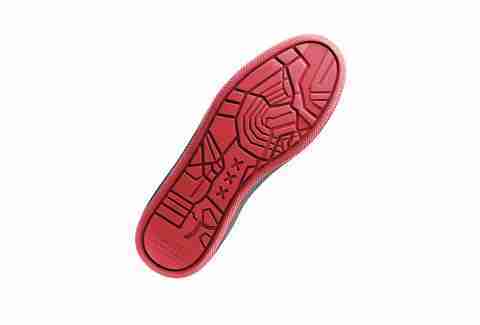 And appropriately, those streets make their way back onto the shoe: There's a map of the city on its sole. This works because gum is actually made from synthetic rubber, so "by breaking down these properties, we were able to create a new type of rubber,” Anna Bullus, managing director and designer at Gumdrop, told The Verge. The project is also hoping to implement a program where the sole can be recycled and replaced once it's worn down -- though you'll have to pay for that service if it gets up and running -- and to expand to other cities. You'll be able to buy them starting in June for 190 euros (roughly $232) in bubblegum pink or black & red. But getting them in any other color than pink kind of defeats the purpose.